Fall fast, and the Wild Country Revo kicks in to catch you even if your belayer fails. Read on for our take on the nuanced assisted-locking belay device, which differs considerably from the GriGri and tube-style belay devices used in climbing. The much-anticipated Wild Country Revo has finally arrived! The visibly unique entry into the belay device field comes to market after a one-year delay in reaching retailers. It hits the shelves exclusively at REI on June 1. Find it at other outlets on July 1, priced at $145 MSRP. 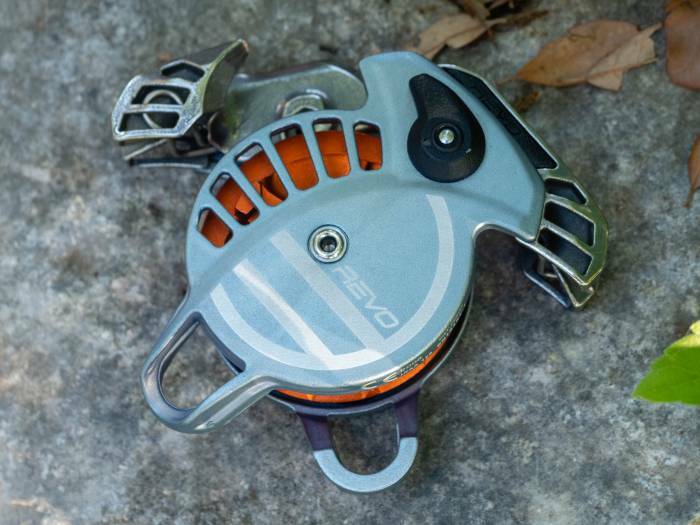 The Wild Country Revo functions just like a tube-style belay device. By executing proper and standard belay techniques, the built-in passive friction aids in arresting the fall and controlling the speed of lowering the climber. If something goes amiss and generates a rope speed exceeding 4 meters per second, the device reliably locks the rope. The Revo is essentially foolproof. First, the belayer cannot load the rope backward. To avoid user error, the locking mechanism is independent of any user handling, left or right handed. Finally, you don’t have to overcome this mechanism to pay out slack. 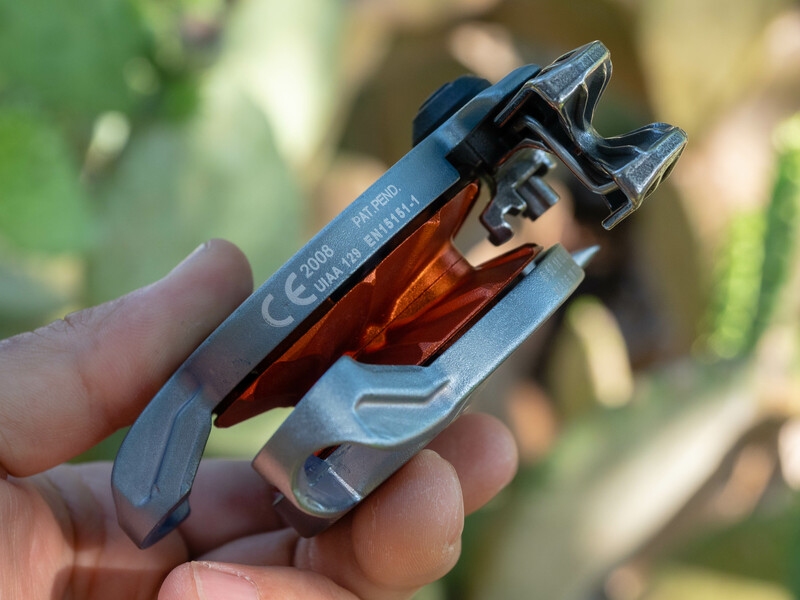 Initial physical comparison to the Petzl GriGri+ reveals that it is slightly larger, and heavier, at 10 ounces versus 7.2 ounces. The device feels solid in the hands, and the fit in finish appears to be of high caliber. A small lever allows the two side plates to spin open on the same axis as the freely spinning inner wheel. Peering inside makes the Revo seem much more complicated than a GriGri+, but it only has one more moving part. It does seem more prone to fouling by dirt, as these moving parts have larger spaces within and between them. The bi-directional nature of the device is immediately apparent. The wheel spins both ways, and the locking mechanism works in both directions, eliminating the possibility of incorrectly loading the rope. It’s also evident that the belayer can’t interfere with the wheel (and thus the locking mechanism) when in use. Finally, the clip-in point for the belay carabiner is on the broader side, necessitating a locking carabiner with a large enough radius to accommodate this dimension. This video released by Wild Country illustrates the inertially activated rope locking mechanism. Wild Country literature states that a rope speed of 4 meters per second, regardless of direction, triggers this locking mechanism, which raises the brake-side “wing.” The belayer can release the lock by tugging down on the brake strand of the rope hard enough to bring the wing down to its original operating position. In the interest of safety, I used the Revo for this first look in the controlled environment of a climbing gym. Once the device was loaded, closed, and attached to my belay loop, the rope traveled easily in both directions. There was much less friction than with any standard or braking-assisted device I’ve tested. Compared to the GriGri, the ease of paying out slack for lead clipping wasn’t even in the same ballpark. It didn’t require any particular technique to prevent an unwarranted lock. And a specific hand position wasn’t necessary to maintain control of the brake strand. The device never locked when hurriedly giving slack for lead clipping. Greatly exaggerating this could trigger a lock, but having to feed rope that quickly for a clip would be unlikely. Catching falls confidently took some mental adjustment. It’s prudent to approach the Revo as a non-assisted belay device. Catching falls with correct belay technique felt similar to using unassisted devices and required the same attention and care. The assisted locking is a separate function that only engages when an error occurs. 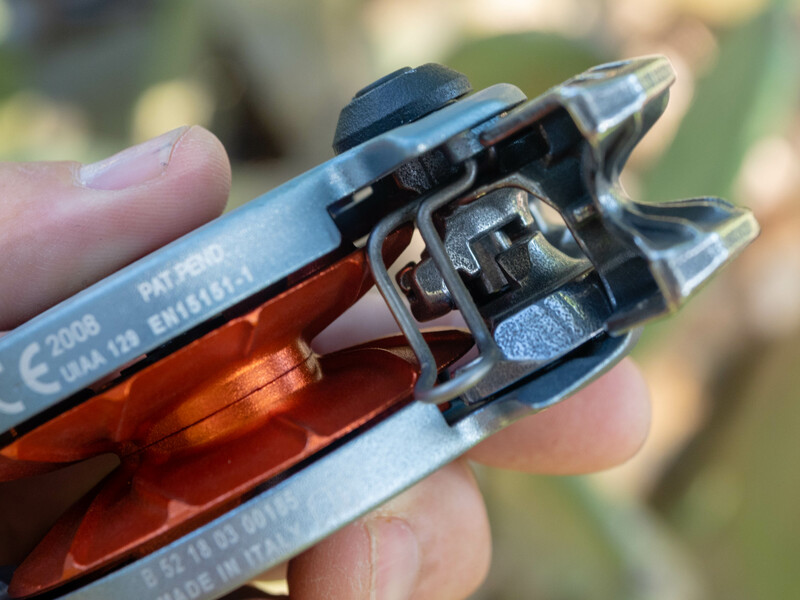 The “emergency only” locking function is fundamentally different than a unit like the GriGri, where the braking assist is always “on.” The wings on the Revo house friction-enhancing grooves, allowing primary operation as a standard non-assisted device. The inertial locking mechanism only interferes with this primary function when the rope speed exceeds the claimed limit of 4 meters per second. The backup braking, or what Wild Country calls “assisted locking,” is reliable. It comes with a comforting click that’s both heard and felt. Note: The time required for the lock to engage depends on the inertial trigger’s location within the wheel’s rotation when the activation speed is reached. The wheel might have to travel almost an entire rotation for the trigger to reach the locking position. This delay is perceptible in use. But again, it would only be in play if proper belaying were to fail. To release the lock, pull down on the brake strand. This disengages the wing and puts the belayer’s hand in the correct locked-off stance for a standard belay device. In my opinion, one of the best things about the Revo is that climbers must use proper belay technique and attention. This is even more judicious with the growing number of gym climbers transitioning to the outdoors. 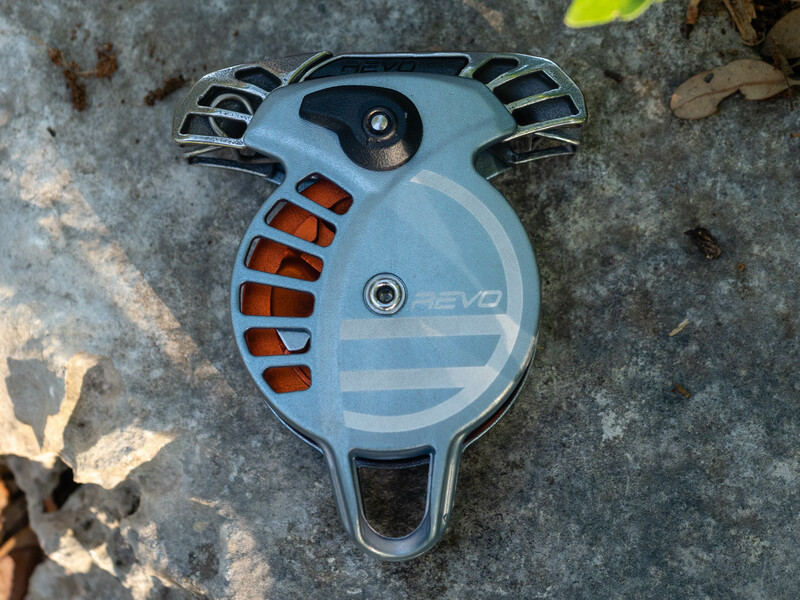 The Revo rope wheel eliminates much of the friction inherent in tube-style belay devices and their corresponding belay carabiners. Thus, you get extremely smooth lowering. Because there’s no camming action to overcome, the bouncing common with other braking-assisted devices is absent. The Revo had the same potential issues as lowering on tube-style devices. One of these difficulties was lowering a climber much heavier than the belayer, requiring careful management of the brake strand, just like a standard belay device. Again, there is a backup locking function that cannot be accidentally overcome by the belayer. The Revo’s most apparent functional shortcoming in comparison to braking-assisted devices was holding the climber in position. It gave up nothing to a tube-style belay device; maintaining the climber’s location required the same control of the brake strand. But compared to devices like the GriGri, which locks the rope quickly during regular use, it was less convenient and required more energy and attention. Activating the Revo lock is easy if the system isn’t loaded by manually lifting the brake-side wing. But if the climber is caught correctly without actuating the locking mechanism, braking manually is required. Locking the rope with the backup mechanism and somehow lifting the brake-side wing were undesirable and inefficient options. Climbers should approach using the Wild Country Revo as a standard belay device with a backup locking feature. In this light, the Revo shines. It feeds and takes up slack just as well or better than tube-style devices and is better at feeding slack to a leader than any assisted-braking device I have tested. And short-roping the leader isn’t a concern. 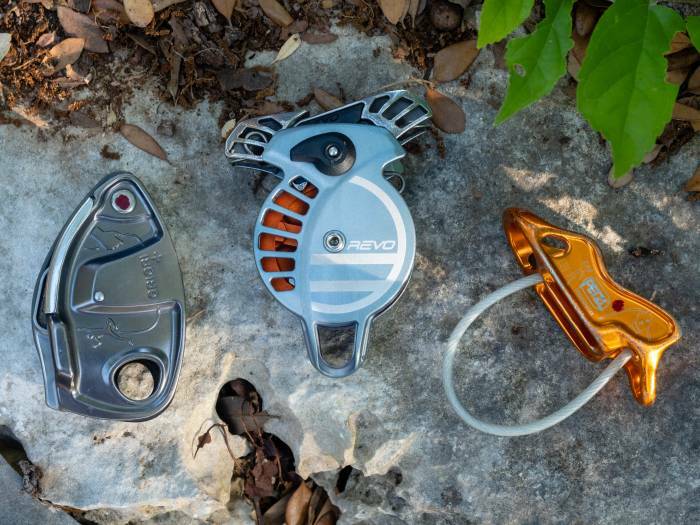 In regular use, the Revo has the limitations of a standard belay device. But I view the requirement of proper belay technique to be a plus, particularly with new climbers or those venturing out from gyms. Compared to other braking-assisted devices, the big limiter is holding the climber in position while working a route. When used appropriately, the device will not automatically lock when the climber voluntarily loads the rope. It requires the same attention and effort as an unassisted device. I’ll continue to test the Revo long-term. My initial impressions indicate that I’ll still prefer the convenience of a GriGri+ if hangdogging is on the agenda. For all other uses, I’ll keep using the Wild Country Revo. I like that it keeps my belaying skills intact, even improving them. I’ll keep an eye on durability, particularly the potential for damage from dirt infiltration.